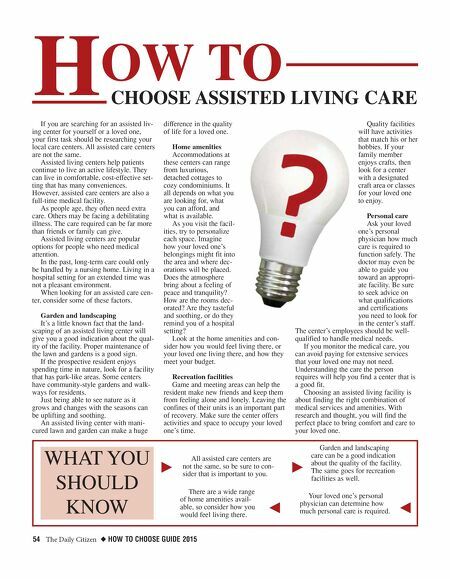 54 The Daily Citizen ◆ HOW TO CHOOSE GUIDE 2015 If you are searching for an assisted liv- ing center for yourself or a loved one, your first task should be researching your local care centers. All assisted care centers are not the same. Assisted living centers help patients continue to live an active lifestyle. They can live in comfortable, cost-effective set- ting that has many conveniences. However, assisted care centers are also a full-time medical facility. As people age, they often need extra care. Others may be facing a debilitating illness. The care required can be far more than friends or family can give. Assisted living centers are popular options for people who need medical attention. In the past, long-term care could only be handled by a nursing home. Living in a hospital setting for an extended time was not a pleasant environment. When looking for an assisted care cen- ter, consider some of these factors. Garden and landscaping It's a little known fact that the land- scaping of an assisted living center will give you a good indication about the qual- ity of the facility. Proper maintenance of the lawn and gardens is a good sign. If the prospective resident enjoys spending time in nature, look for a facility that has park-like areas. Some centers have community-style gardens and walk- ways for residents. Just being able to see nature as it grows and changes with the seasons can be uplifting and soothing. An assisted living center with mani- cured lawn and garden can make a huge difference in the quality of life for a loved one. Home amenities Accommodations at these centers can range from luxurious, detached cottages to cozy condominiums. It all depends on what you are looking for, what you can afford, and what is available. As you visit the facil- ities, try to personalize each space. Imagine how your loved one's belongings might fit into the area and where dec- orations will be placed. Does the atmosphere bring about a feeling of peace and tranquility? How are the rooms dec- orated? Are they tasteful and soothing, or do they remind you of a hospital setting? Look at the home amenities and con- sider how you would feel living there, or your loved one living there, and how they meet your budget. Recreation facilities Game and meeting areas can help the resident make new friends and keep them from feeling alone and lonely. Leaving the confines of their units is an important part of recovery. Make sure the center offers activities and space to occupy your loved one's time. Quality facilities will have activities that match his or her hobbies. If your family member enjoys crafts, then look for a center with a designated craft area or classes for your loved one to enjoy. Personal care Ask your loved one's personal physician how much care is required to function safely. The doctor may even be able to guide you toward an appropri- ate facility. Be sure to seek advice on what qualifications and certifications you need to look for in the center's staff. The center's employees should be well- qualified to handle medical needs. If you monitor the medical care, you can avoid paying for extensive services that your loved one may not need. Understanding the care the person requires will help you find a center that is a good fit. 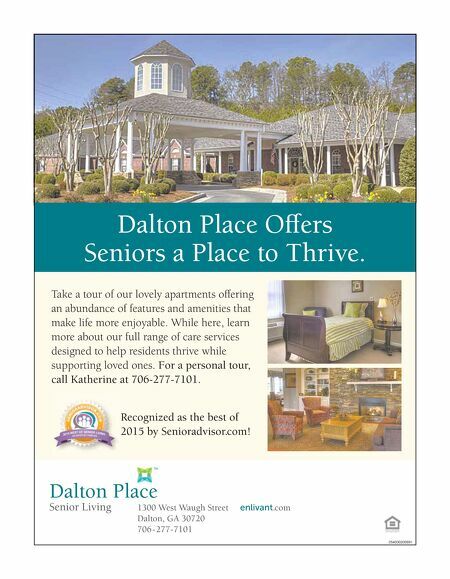 Choosing an assisted living facility is about finding the right combination of medical services and amenities. With research and thought, you will find the perfect place to bring comfort and care to your loved one. H OW TO CHOOSE ASSISTED LIVING CARE WHAT YOU SHOULD KNOW k j All assisted care centers are not the same, so be sure to con- sider that is important to you. There are a wide range of home amenities avail- able, so consider how you would feel living there. k j Garden and landscaping care can be a good indication about the quality of the facility. The same goes for recreation facilities as well. Your loved one's personal physician can determine how much personal care is required.